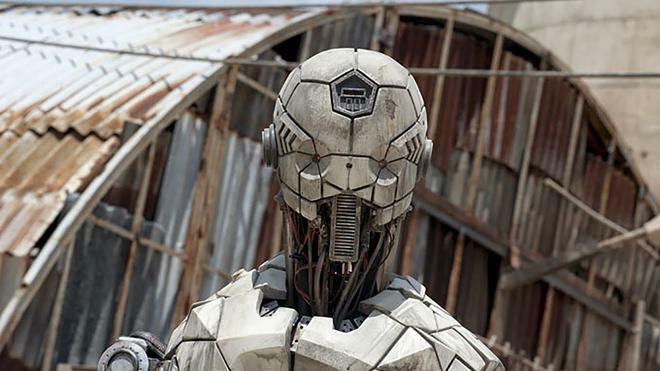 In a future where Earth's ecosystem verges on collapse, man-made robots roam the city to protect dwindling human life. When a robot overrides a key protocol put in place to protect human life, ROC Robotics insurance agent Jacq Vaucan (Antonio Banderas) is assigned to locate the source of the manipulation and eliminate the threat. What he discovers leads Vaucan, ROC Robotics and the police into a battle with profound consequences for the future of humanity. As a big fan of science fiction and film noir, I always get a little excited whenever a movie decides to mix both genres. In fact, this blending of styles has resulted in some of my favorite films ('Blade Runner,' 'Dark City,' 'Brazil,' 'World on a Wire'). With this in mind, I was really looking forward to watching Gabe Ibáñez's 'Automata.' Taking his cue from classic detective yarns and the works of Isaac Asimov, the director creates a visually impressive sophomore feature, using men and robots to tackle familiar but intriguing themes about humanity and sentient life. Sadly, while the film's sci-fi noir aesthetic is strong, the writers never develop the script's plot or ideas enough, creating a story that is marred by unfulfilled potential. On the surface we get everything a tech noir fan could want -- a dystopian future, a brooding protagonist, a dangerous insurance investigation, plenty of trench coats, and lots of rain -- but the narrative ultimately feels unfinished and, like its robot stars, in desperate need of repairs. Set in 2044, the film follows an insurance investigator named Jacq Vaucan (Antonio Banderas) who works for a robot manufacturing company. Used for manual labor and aid, these robots -- called Pilgrims -- are produced with two failsafe protocols that prevent them from harming humans and altering their own design. But when Jacq stumbles upon a Pilgrim who appears to be able to modify itself, a potential conspiracy is discovered that could hold dire consequences for both man and machine. After some requisite text exposition that sets up the movie's future world and robot rules, the film transitions into a delightfully creative main titles sequence that perfectly establishes the Pilgrims' place in society. With triumphant music blaring in the background, we're treated to still photographs that depict the robots' initially idyllic integration into everyday life. But as the sequence continues, the photos become increasingly bleak as the once celebrated mechanical workers are subjected to callous mistreatment and abuse. Economical and surprisingly affecting, these simple images engender potent science fiction metaphors for real life exploitation and prejudice. Unfortunately, once the actual narrative begins, most of these potentially interesting ideas end up falling by the wayside. On the plus side, the first act is actually rather engaging, and director Gabe Ibáñez does a very solid job of creating a believable atmosphere, complete with commendable production designs and effects work considering the movie's comparably modest budget. Sure, the film's style is highly reminiscent of other similar efforts like 'Blade Runner' and 'I, Robot,' but the aesthetic works very well and the bleak and gritty visuals help to create a palpable noir mood. Likewise, the filmmakers' decision to primarily rely on practical effects and puppetry to realize the robots is refreshing and the results are quite impressive. As far as the human characters go, Banderas is also good in the lead role, bringing an appropriately downtrodden but ultimately heroic aspect to Vaucan. Sadly, the plot itself leaves a lot to be desired and there are times when it feels like there are connective pieces missing between certain developments. On that note, character motivations are often a bit muddled and thin as well. This is especially true for the antagonists, and I'm not really sure why they decide to react so violently against Vaucan when he was seemingly just doing his job. Dylan McDermott's wholly one-note character is probably the worst offender in this regard, and the man just comes across as angry and psychotic for no apparent reason. Questions dealing with the nature of artificial life, freedom, and technological evolution are all broached, yet none of these concepts are really expanded upon or examined in any meaningful way. The central conceit involving robots who have apparently grown beyond their original programming holds a lot of potential, but the eventual solutions to the script's mysteries are very anticlimactic, uninspired, and shallow. There are times when 'Automata' demonstrates genuinely creative flashes of a good film. It's just a shame that these instances end up being pushed aside in favor of muddled plotting and generic thriller beats. Still, there is a lot to admire about the movie's tech noir style. The narrative is derivative and problematic, but Ibáñez demonstrates a lot of promise as a visual director -- he just needs to learn how to flesh out his storytelling skills a bit more. For fans of other sci-fi noir flicks, this is certainly worth a look, but the end results just can't measure up to the many similar and far superior efforts in the genre. Millennium Media brings 'Automata' to Blu-ray on a single BD-25 disc that comes housed inside a keepcase with a cardboard slipcover. After some skippable trailers, the disc transitions to a traditional menu screen. The packaging indicates that the release is Region A coded. The movie is provided with a 1080p/AVC MPEG-4 transfer in the 2.35:1 aspect ratio. Though the cinematography and production design are strong, the image is held back by a relatively low-grade digital appearance and some minor artifacts. The digital source is mostly clean and pristine, but there is some marginal banding and noise, particularly in dark scenes. Overall clarity is solid, highlighting the bleak noir influenced sci-fi sets and wardrobe choices. With that said, the image carries a predominantly flat look and occasionally features an overly smooth video quality in motion. Colors stick to an appropriately brooding palette of desaturated tones and sickly greys and yellows. While this doesn't result in the most pleasing or vibrant picture, it suits the story well. Indoor scenes can look a little dim but outdoor sequences in the desert offer high contrast with blown out whites. Shadows are decently rendered, but black levels often veer toward an elevated gray. 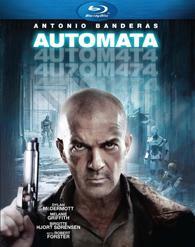 Considering its fairly low budget, 'Automata' looks pretty good on Blu-ray. While detail is never razor sharp and the image lacks dimension and pop, these deficiencies are likely a result of the original shooting methods and digital equipment used. The film is presented with an English Dolby TrueHD 5.1 track and a Dolby Digital 2.0 track along with English SDH and Spanish subtitles. With moody ambiance and spacious design, this is a very effective mix. Speech is clear and full throughout with no balance issues -- though Banderas' trademark accent isn't always easy to decipher. The film's opening pre-credits sequence features some immersive electronic effects and disperse voices, offering an enveloping introduction to the story. General city ambiance is solid, spreading appropriate atmospheric sounds around the room, bringing the movie's rainy streets and alleyways to life through engaging surround use. Imaging and directionality are also smooth, and action sequences offer decent bass activity when bullets start blazing. With that said, explosions and gunshots don't carry the same kick that's found on more robust mixes. Dynamic range is relatively wide and distortion free with no notable technical hiccups. The sound design isn't as layered or textured as bigger budget sci-fi efforts, but the effects create a convincing surround sound environment that complements the visuals well. Making Of (HD, 5 min) – This is a brief behind-the-scenes featurette with cast and crew interviews. The participants offer some details on the film's influences, noir style, characters, and user of practical robot puppets and effects. Theatrical Trailer (HD, 2 min) - The film's trailer is included in 1080p with Dolby Digital 2.0 sound. 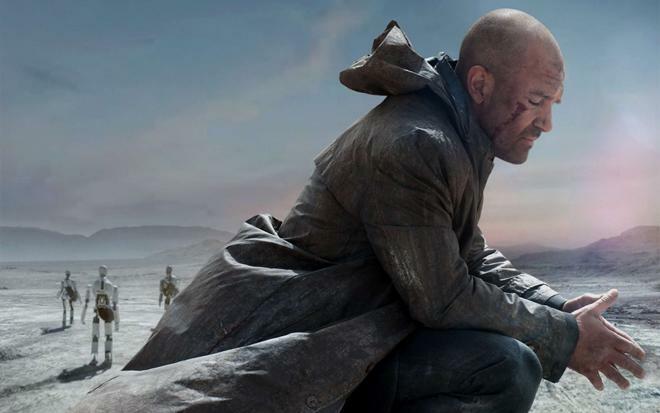 'Automata' is a visually engaging sci-fi noir that is sadly marred by unfulfilled potential. The style and effects are strong, but the film's plotting and characterizations are disappointingly thin and muddled. Despite a few issues, the video transfer is solid and the audio mix is strong. Unfortunately, the only real supplement we get is a very brief making of featurette. The movie never lives up to its initial promise, but this disc is still worth a look for fans of the genre.